Our new website is fantastic! Not only is Trent at TMD Online easy to work with but his advise, knowledge and professionalism is second to none! 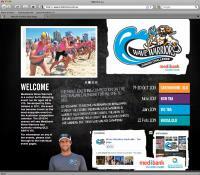 Wave Warriors website needed a whole new rebuild and the advise he gave us was exceptional - the site is now much more user friendly for both the customer and for us. I have no hesitation in recommending TMD Online.